When I was younger and in (home)school having to learn about history, I didn't want to. I huffed and puffed and pouted & did everything I could to keep from reading because I thought history was so boring. I also never liked reading, though you wouldn't be able to tell now because I love reading. Anyway, the cover of this book(mostly the Fleur De Lis') & the info about it was what made me want to read more. I love historical fiction. I am FROM Louisiana, & I also recently found out that my family on my father's side are both Canadian & Cajun French, so I love reading any and everything about the French settling of America and more recently I've become obsessed with learning about the history of New Orleans, so I think this book is especially interesting. 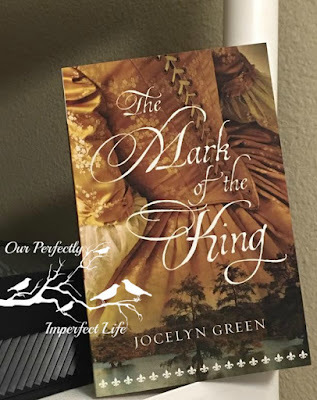 This was my first time reading anything by Jocelyn Green, and like always I'm nervous when reading something an Author that is new to me. I worry about if they will get historical facts correct, whether or not the characters are in depth or if they are flat and boring. Thankfully that was not the case with "Mark of the King"